I’ve made a little video that – in my usual rambling semi-coherent fashion – goes into a little more detail about this process. As usual, if you know how to do this it’s nothing new. But if you don’t really get how Roles and Share Presets work, hopefully this will be of some use. EDIT: Couple things I was vague about (as usual) I wanted to clear up. First, as pointed out in a comment below, you need to set a default Share Destination so you can use the CMD E shortcut properly. You do this in the Destinations Preference tab. EZ. The other thing, which I can’t stress enough, is how much simpler and less prone to user error it is to spit versions out of FCP X – Even if the spot was cut in another NLE, or onlined somewhere else. Why? Once your Share Presets are created, all the work is done. No enabling/disabling video or audio tracks for each export. No need for duplicate sequences. You can export Stereo Comps and/or Multichannel mixed Stereo and mono Splits from a single timeline. With multiple cuts, no need to repeat/match/copy/paste all your A/V track assignments and audio configurations for every timeline. I’m not being facetious here. 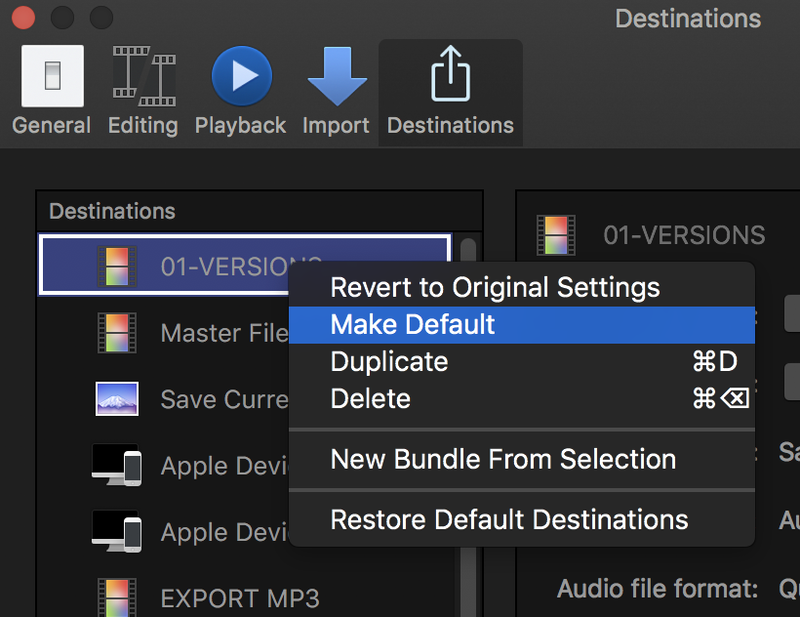 No matter what NLE you use, if you need to export multiple versions of multiple spots with any regularity, you should be using FCP X to do it. Great content. Thank you. I would only suggest you explain that CMD-E does nothing unless you set it up first. For those reading this who do not know, CMD-E is your default Share. The Share you use most often. Select a Share from your list of export options and right click on the Share you use most and choose ‘Make Default’. From then on, you don’t have to go to your Share button and scroll down the list to choose what Share to use. Just CMD-E to use your default Share. Hi Don. Glad it was interesting. 🙂 You’re correct abuot the default destination too, I’ll update the post. Couple other things I was vague about that I’ll try to clarify as well. Thanks! Well you skipped the best feature of FCP X’s export magic. After creating your presets, you can also create a ‘bundle’, add all those export settings to that ‘bundle’, and with one click you get all edits exported!